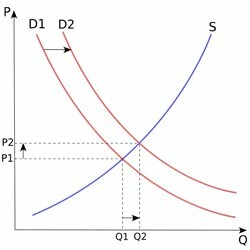 As demand for the shares increases from Q1 to Q2, the price increases from P1 to P2, shifting the demand curve upwards from D1 to D2. Prices could also increase when supply decreases while demand remains constant. When stock prices fall it is either because demand decreased or supply increased. The other thing to keep in mind is that 50% to 70% of the trading in stocks today is between two computers. Computers make decisions based on complicated algorithms designed by their masters. While it is possible the one-tenth of one percent same store sales increase is a component in an algorithm here or there, my guess is it’s not a big driver and certainly not the only one. Assume the government releases the statistic at 9:00 am. By the time the markets open the algorithms have already reflected the new statistic, meaning the computer already knows whether it wants to buy or sell at the opening bell and at what price. What’s happening the rest of the day? At best the release of the statistic is like a stone tossed into a pond that generates a few ripples. After that, clear water. It certainly is not the driver of all purchases and sales. At the end of the day the markets went up or went down. Unless the change has caused your portfolio to become unbalanced, do yourself a favor and ignore the market pundit.